18" seat width now available! 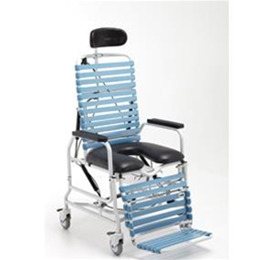 The Broda CS 385 Commode Shower Chair is designed for use by individuals who are caregiver dependent for commode and shower needs.The chair accommodates easy side transfers through swing away, removable arms. It also helps facilitate front transfers through anterior tilt and a flip up removable footrest. This chair has a padded commode seat and 12° of posterior tilt, 10° anterior tilt and up to 67° of back recline, giving you numerous positioning options to help control slumping, sliding, and falls while maintaining your residents' comfort and safety.